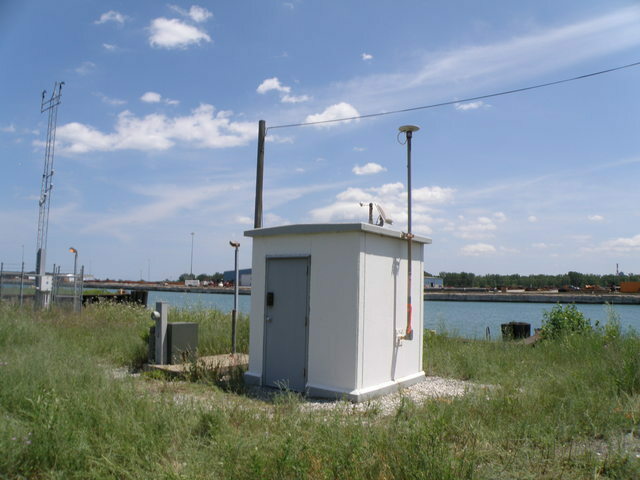 How to reach: TO REACH THE NOS GAUGING STATION, IN COOK COUNTY, CHICAGO, ILLINOIS, (FIRST CHECK IN AT GUARD STATION FOR LAKE SIDE MARKETING). TO REACH LAKE SIDE MARKETING, FROM INTERSECTION OF 87TH AND BURLEY (3432) AVE. TURN NORTH ON BURLEY ST AND GO TO 86TH ST. TURN EAST AND GO TO END (SOUTH GREEN BAY AVE AND E 86TH ST). GUARD WILL HELP YOU. TO GO STRAIGHT TO STATION, FROM INTERSECTION OF (3432) LAKE SHORE DR.(HWY N41)AND 87TH ST. PROCEED EAST ON 87TH, GATE TO STATION IS (N41 44' 24.9",W087 32' 18.9"), IS FIRST DIRT RD (APPOX 40 YARDS), ON RIGHT (WITH AN ARMY CORP OF ENGINEERS SIGN ON FENCE). THEN FOLLOW GRAVEL ROAD WEST (RIGHT) APPROXIMATELY 0.4 KM (0.25 MI) TO SECONDARY GATE (OR FIRST RIGHT), PROCEED SOUTH (RIGHT) ALONG SECONDARY GRAVEL ROAD APPROXIMATELY 0.2 KM (0.12 MI) TO GAUGE SITE.